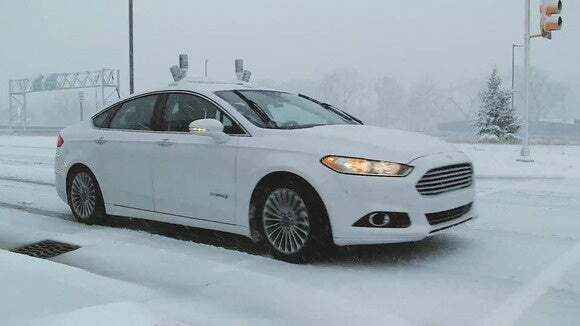 Ford is giving its autonomous cars a challenge not yet faced by Google's self-driving car fleet in Silicon Valley: snow. Seeing where you are going in the snow is challenging for humans but more so for computers, which lack intuition and rely solely on their digital inputs. If the radar and laser imaging sensors can't see lane markings or road signs, how's a car to figure out where it is? Ford's solution, which it calls "snowtonomy," relies on high-definition maps that can fill in the gaps when road markings can't be seen. The car takes all the visual cues it can from the laser-imaging LIDAR sensors on the roof and matches that up to the pre-loaded map, to get an accurate fix on its location. If the system is accurate enough, and Ford says it is, the car is able to keep to its lane even when the lane markings are covered in snow or slush. "This testing will help us take fully autonomous vehicles to the ultimate level," said Raj Nair, Ford's chief technical officer, at a news conference on Monday at the North American International Auto Show in Detroit. 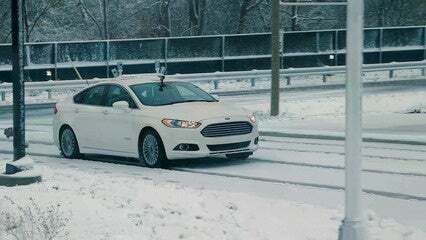 Ford has been testing this out at Mcity, a fake city built by the University of Michigan for testing autonomous cars. The location near Detroit means there's plenty of opportunity for testing in the snow. As car makers gain more and more miles of data about autonomous driving, they are looking for new challenges. After all, driving straight and keeping into between lane markings is a relatively easy task in the world of self-driving. Google, which has covered the most ground in autonomous vehicle testing, doesn't often face hostile weather in Silicon Valley, but a recent break in California's multi-year drought has provided a chance to test out its cars in the rain. "Our laser sensors are able to detect rain, so we have to teach our cars to see through the raindrops and clouds of exhaust on cold mornings, and continue to properly detect objects," the company said last week. Ford is throwing an increasing amount of resources behind its self-driving car research. Last week at CES in Las Vegas, the company said it plans to triple the number of cars it has on city streets and test tracks to research autonomous driving technology. The expansion will see around 30 test vehicles on the streets and test tracks of Michigan, Silicon Valley and in Arizona.